I can't believe they are still using bamboo scaffolding, it looked dangerous in '89 when I was there, but now in the age of H&S it seems crazy. You have drawn it so well and I like your choice of background colour to emphasis the bamboo. Wonderful drawing. Are you almost done? I totally understand the last minute feeling. I am pushing the deadline as well. Your journal is very cohesive. Yes, your background is terrific. This project is very very well done. 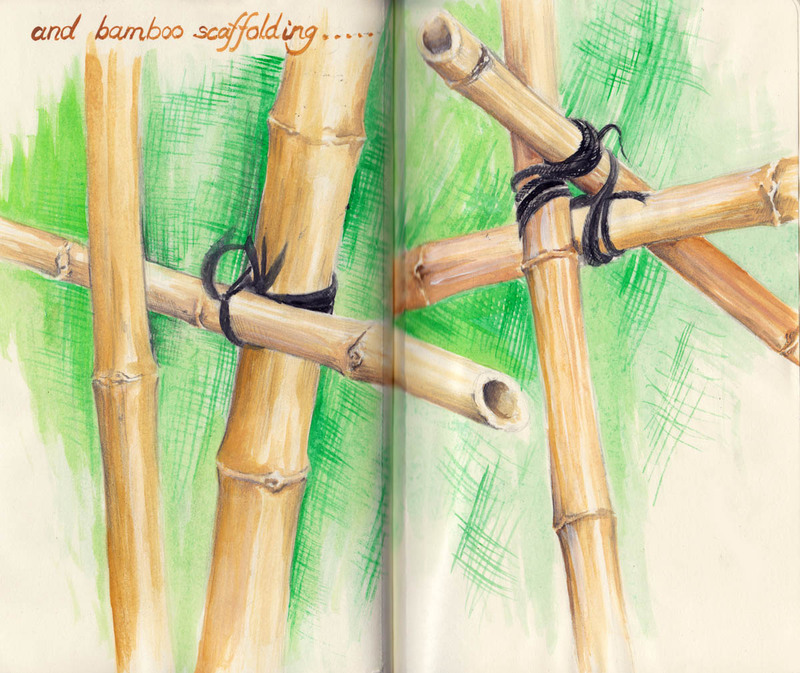 I love the look of bamboo scaffolding. Of course, my opinion would maybe change if I saw it in person, like Sue! Very nice drawing! Fantastic work, very realistic, and it looks great! Wow. Nicely done! Great detail on the bamboo. Love the bamboo and your green background!